The emerging technologies of the Fourth Industrial Revolution offer unprecedented avenues to improve quality of life, advance society, and contribute to global economic growth. Yet along with greater prospects for human advancement and progress, advancements in these technologies have the potential to be dramatically disruptive, threatening existing assumptions around national security, rules for international cooperation, and a thriving global commerce. 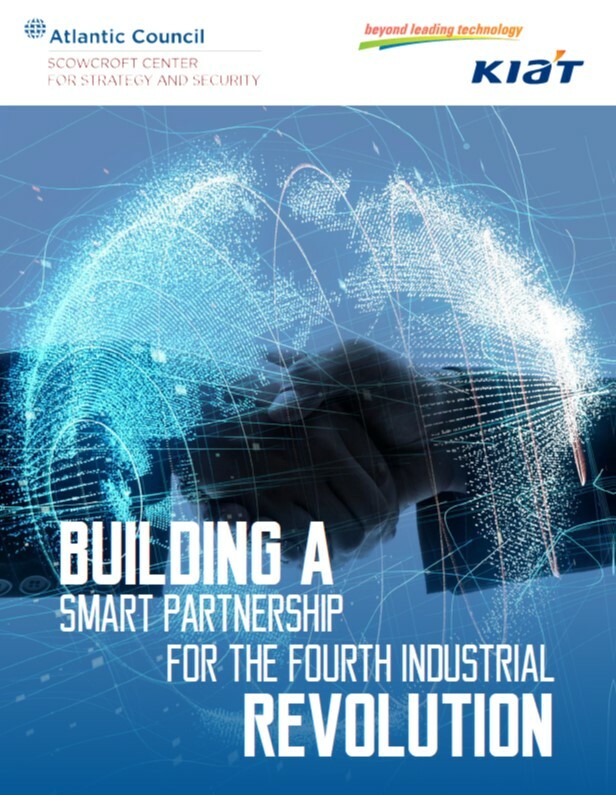 This report by the Atlantic Council’s Scowcroft Center for Strategy and Security and the Korea Institute for Advancement of Technology (KIAT) addresses emerging technologies in key areas of the Fourth Industrial Revolution and explores innovative ways by which the United States and the Republic of Korea can cooperate around advancements in artificial intelligence and robotics; biotechnology; and the Internet of Things. Each chapter focuses on one of these scientific advancements, with two authors exploring the technology from the perspective of the United States and the Republic of Korea, respectively. Building off the work already underway in both countries, the authors of this report examine opportunities for continued growth and development in these key areas, offering concrete, distinct recommendations for increasing US-ROK cooperation around each technology as the world moves further into the Fourth Industrial Revolution. The open, rules-based international order in Asia is under threat. The set of post-World War II arrangements designed by the United States and its allies and partners provided an unprecedented degree of stability, security, prosperity, and freedom globally and in the region but the continuation of this system under US leadership is no longer guaranteed. As the United States and its Asian and European allies and partners face a diverse array of new challenges in the Asia-Pacific and at home, Washington must reassess its goals, strategy, policies, and its very commitment to leadership in the region. At a time when the United States promotes “America First,” to what extent does a dated order in Asia continue to serve US and allied interests? Will the United States be willing to sustain its long-standing security-provider role in the region, and do its allies find preexisting US commitments credible? How can the United States, and likeminded Asian and European states, best contribute to security, prosperity, and democratic values in the region? Does China’s rise permit the possibility of greatpower cooperation, or is some level of competition —and even outright conflict— inevitable? To what extent, in the changing regional economic architecture, are the United States and its partners willing to make alterations in governance structure in order to adapt to the new economic weight of emerging economies? How do issues that are likely to be high-priority agenda items in the near future (e.g., food, water, and energy security; the environment; urbanization; demographic change; and disruptive technologies) challenge existing frameworks that have shaped regional affairs and societies? These are among the questions that must be addressed as the United States seeks to secure its interests in Asia, and as Asian partners look to the United States for leadership. The Asia-Pacific may be the world’s most dynamic geopolitical region. According to some projections, the majority of all global economic activity could take place within Asia by 2050. The balance in Eurasia is shifting. China’s President Xi Jinping has ambitious visions for Asia, while the rest of the world reshuffles to find its place in the rapidly changing global order. Each nation guesses at the United States’ new role in the world, while China broadcasts its own role across the globe, ready to challenge those who stand in opposition to its vision. China’s impact is global: reaching from the perils of the Korean peninsula; stretching across Asia, the Middle East, and Africa; and influencing regimes along the way. During this historic moment, the importance of Asia to US interests grows all the greater. Emerging artificial intelligence (AI) tools will provide propagandists radically enhanced capabilities to manipulate human minds. Human cognition is a complex system, and AI tools are very good at decoding complex systems. Interactions on social media, browsing the Internet, and even grocery shopping provide thousands of data points from which technologists can build psychological profiles on nearly every citizen. When provided rich databases of information about us, machines will know our personalities, wants, needs, annoyances, and fears better than we know them ourselves. Over the next few years, MADCOMs—the integration of AI systems into machine-driven communications tools for use in computational propaganda—will gain enhanced ability to influence people, tailoring persuasive, distracting, or intimidating messaging toward individuals based on their unique personalities and backgrounds, a form of highly personalized propaganda. In The Euro’s Difficult Future – Competitiveness Imbalances and the Eurozone’s North-South Divide author Luigi Bonatti, a professor of economics at the University of Trento in Italy, stresses that the existing North-South competitiveness divide creates growing tensions between member countries and fuels hostility towards European Union institutions. The paper illustrates why this competitiveness divide is structural, cannot be tackled by macroeconomic policies, and could threaten the euro’s survival. The European Union (EU), a vital partner for the United States, is facing numerous challenges, including massive migration flows, the UK’s vote to leave the EU (Brexit), and rising support for anti-EU and populist parties in upcoming elections in several European countries. In Charting the Future Now: European Economic Growth and its Importance to American Prosperity, the Atlantic Council’s EuroGrowth Initiative proposes pragmatic steps to restore European economic growth, safeguard the European project, and reinvigorate the transatlantic alliance. Backed with rigorous data, the report highlights the crucial importance of the European economy for the US and proposes ways to galvanize the transatlantic relationship. Focusing on feasible projects and reforms, the report then looks at various policy proposals to increase growth and create jobs in the short, medium, and long term. To many Americans, the difficult issues facing Central America’s Northern Triangle—El Salvador, Guatemala, and Honduras—may seem distant. But the future of the United States is tied to these countries as some of our closest neighbors. Geography alone demonstrates that their stability and prosperity is critical to our national interest. No one can be complacent about geopolitical risks these days. The shocks and surprises of the past few years show how easily assumptions about liberal markets, international relations, conflict, and democracy can be shaken. Geopolitical volatility has become a key driver of uncertainty, and will remain one over the next few years. Sixty years after the signing of the Treaty of Rome, Europe faces its greatest challenges, and possibly its sharpest turning point, since World War II. The spectrum of possible futures for Europe is wide, encompassing everything from rebirth to disintegration. But, a strong leap toward greater EU-wide integration—as was sometimes the outcome of earlier crises—seems unlikely at best. Instead, this seems a time for smaller steps toward more integration, most likely in response to specific challenges, including: stronger external border controls; enhanced eurozone governance; or a more capable Common Security and Defense Policy. If the positive option is modest integration, the alternative future is one dominated by a clear break with past integration. A presidential victory in May by France’s Marine Le Pen could splinter the European Union, sending it into a tailspin toward disintegration. Even if this dire forecast is avoided, Europe—and especially the European Union (EU)—will face challenges that push it into entirely new directions. If the United States withdraws from Europe, for example, will Europe be forced to accommodate Russian demands? Or will that challenge foster stronger security cooperation among a core set of nations, to counterbalance a weakening NATO? And if Europe’s economy continues on a slow-growth path, will it be able to afford to respond to the challenges it faces? In this report, Europe in 2022: Alternative Futures, Frances Burwell’s transatlantic expertise joins Mathew Burrows’ deft trends analysis to offer a sobering look at the possible future for Europe with the hope of reigniting the bond between Americans and Europeans so that we may build a better future together.